Stand Watie was the only American Indian to attain the rank of brigadier general during the Civil War, and was the last Confederate general to surrender (see Formal Surrender Order of Final Confederate Forces). He was born in Georgia in 1806. When the federal government began moving Cherokees from Georgia, Tennessee and North Carolina to a home west of the Mississippi, Stand Watie was one of those who supported the move. As a signer of the Treaty of New Echota in 1835, which provided for removal of Cherokees to the west, Stand Watie gained enmity of those opposed. East and West of the Mississippi River, Cherokee Indians comprised the final Confederate forces that officially surrendered to Union authorities. Among the battles in which he participated were Wilson Creek, Bird Creek, Pea Ridge and Cabin Creek. In the battle of Cabin Creek, the Confederates routed the Union soldiers and captured about three hundred wagons loaded with supplies. This enabled the destitute Indian Confederates to continue in the war for a short time. Watie surrendered his command to Peter Pitchlynn at Doaksville near Fort Towson on June 23, 1865. Watie's surrender was the final formal surrender of Confederate forces. East of the Mississippi River, Walker's Battalion, Thomas' Legion of Cherokee Indians and Highlanders was the final Confederate force to formally surrender to Union officials. He died September 9, 1871, near Grove, Oklahoma. He was considered by many to be a man of courage, leadership and loyalty. 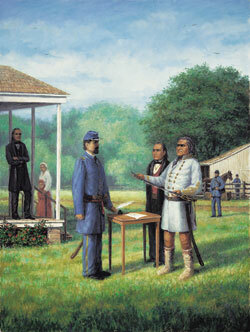 Surrender of General Stand Watie by Dennis Parker was dedicated on May 2, 2000. The commission was managed by the Oklahoma State Senate Historical Preservation Fund, Inc. The painting is located outside the Oklahoma State Senate lounge on the fourth floor of the Oklahoma State Capitol and can be viewed daily from 8:30-5:30 when the Senate is not in session. Dennis Parker feels his best work is done working out of doors from life or in front of a model. "Painting on the spot, I feel I get more of a sense of light and color, and the interaction with live impressions gives the painting a freshness that is hard to capture any other way," said Parker. He studied three years as an apprentice under artist Richard Goetz. Later, while attending the New York Art Student's League and the New York Academy of Art, Dennis' instructors included such notable artists as Daniel Green, David Laffel and Ted Jacobs. He has also studied individually with Joe Beeler and Albert Handell. Dennis has participated in national shows winning honors for both pastels and oils. He also teaches and demonstrates his art throughout the state. Recommended Reading: Civil War Terror (History Channel) Description: This is the largely untold story of a war waged by secret agents and spies on both sides of the Mason Dixon Line. These are tales of hidden conspiracies of terror that specifically targeted the civilian populations. Engineers of chemical weapons, new-fangled explosives and biological warfare competed to topple their enemy. With insight from Civil War authorities, we debunk the long-held image of a romantic and gentlemanly war. To revisit the past, we incorporate written sources, archival photographs and newspaper headlines. Our reenactments bring to life key moments in our historical characters' lives and in each of the horrific terrorist plots.